Rob, unlike the other Louws, who were all tight forwards, specialised as a loose forward. He had speed, agility and anticipation and could handle the ball like a three-quarter. As a forward, he had the weight as well as mobility. He was fast enough to play among the backs and as such must be rated as one of the best Springboks ever to represent South Africa. Rob had the habit of popping up whenever and wherever he was least expected and with that knack he scored a wonderful try against the 1980 Lions. 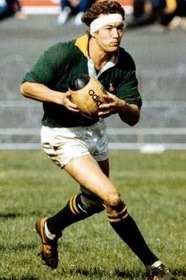 Rob Louw - a superb ambassador for South Africa on the 1981 tour of New Zealand. His friendly manner and attractive personality overcame many obstacles.